Through Resnick Neuropsychiatric Hospital program that encourages community engagement, staffers (from left to right) Jamie Chazen, Erika Lozano, Robbie Harries-Depriest, Leilanie Ayala, Sunnie Dishman are raising awareness about bullying in Compton schools. Maybe bullying would be easier to stop if kids themselves knew how to recognize it. If so, a lesson in the differences between normal teasing and bullying might be best delivered in the location where so much teasing takes place: school. To that end, a team from Resnick Neuropsychiatric Hospital at UCLA recently led a six-session bullying awareness program in Compton Unified School District designed to teach kids the difference between teasing and bullying – and how to “act” to stop it. 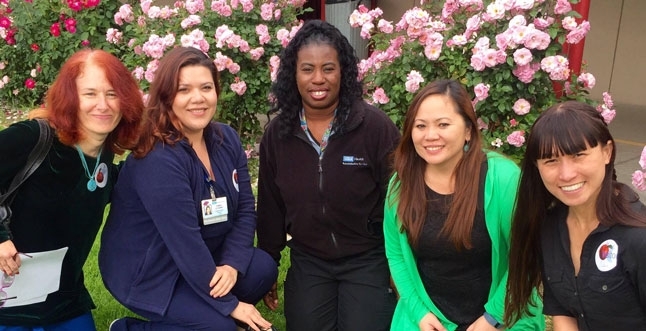 The team – consisting of three registered nurses, a mental health practitioner and a recreational therapist – hopes to eventually establish a community-wide bullying intervention program in the district. More than a year in the planning, the anti-bullying effort is believed to be the first of its kind in Los Angeles County. “Studies have shown that a lot of bullying experiences – in person and online -- are not addressed because kids tend not to tell their parents or guardians about them,” explained Leilanie Ayala, a Resnick registered nurse who led the team. Team members first gave an hour-long presentation to social workers, school counselors and school nurses in the district’s pupil services department. They then provided five sessions at Emerson Elementary School, including a 30-minute presentation to the school’s teachers and four hour-long group sessions with the school’s sixth graders. A-ssess if the situation is bullying. C-all for help and T-ell a trusted adult. The team’s efforts were quite obviously needed, said Ayala, who is a nursing professional development specialist. The project was an initiative of the UCLA-Resnick Global Health and Community Outreach Committee, which encourages volunteer efforts among staff. To thank the Emerson sixth-graders for their participation, the team is bringing them to campus April 25 for a tour. Other team members were Jamie Chazen, a mental health practitioner; Erika Lozano, a registered nurse; Robbie Harries-Depriest, a certified recreational therapist; and Sunnie Dishman, a registered nurse.